Several light years ago, Dan and I lived with our friend Donna Mae and her cat, Stinky. One night Dan was home alone and Stinky scratched at his bedroom window so Dan compliantly let her in. Twenty minutes later Stinky showed up at his window again (having got out through the cat door) and meowed cutely. Dan let her in again. Apparently this went on for an hour, Stinky riding on the ferris wheel of Dan’s window, around and around until Dan finally realized the cat was playing a game and he was the sucker. When I came home that night I found a note from Dan saying: Stinky is no longer cool. This still cracks us up, 13 years later, and I thought of it tonight as I realized that I too, am no longer cool. 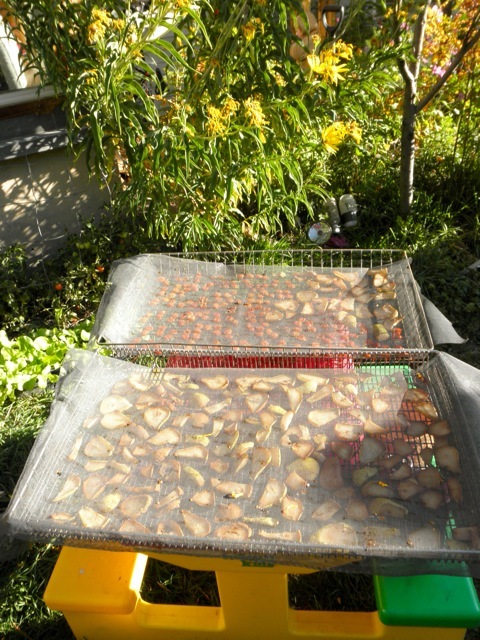 I am no longer Zen Mama beaming from my zucchini-stuffed cushion while fall bursts like fireworks outside. I am no longer singing peaceful come what may anthems while the seasonal lights flicker off. No, tonight I’m hobbling around the soggy garden, laying sheets and blankets over the tomatoes, shivering and cursing the storm blowing in like a bad omen, a bad omen that smells a lot like frost. Turns out, I don’t mind the garden withering as long as it’s still 80F degrees out and the tomatoes are coming off in my hand. The homeschool co-op, which meets once a week in alternating parents’ houses is like something that Mr Roarke and Tattoo might have dreamed up for disgruntled first graders on Fantasy Island. Oh, you kids are sick of worksheets? 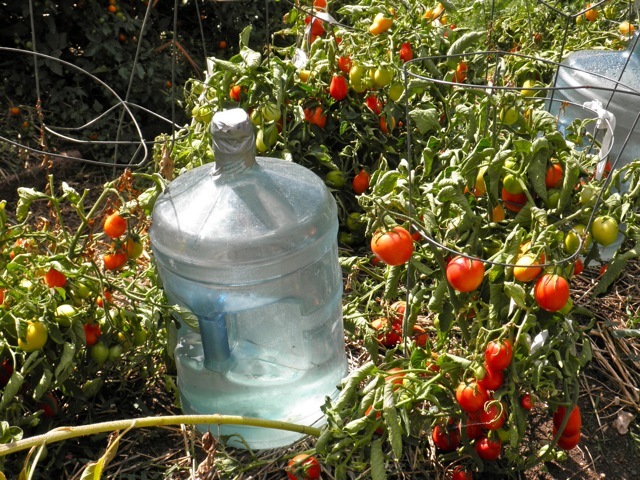 How about hands-on science experiments demonstrating how plants expire water? How about class held outside? And hey, just take as much time as you need to eat lunch or finish a project. 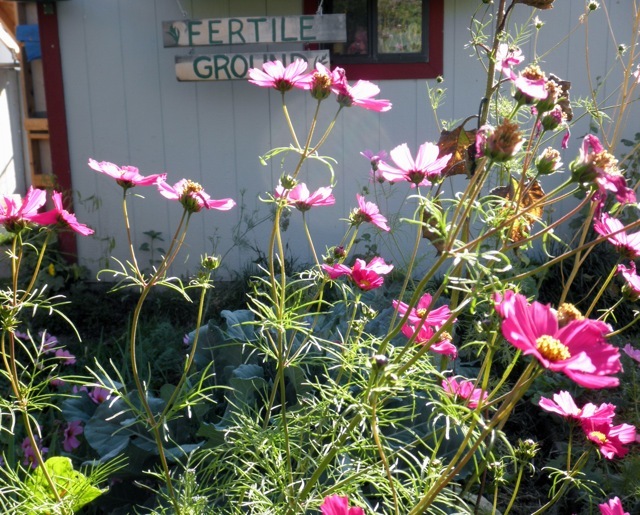 The homeschool co-op’s first 4-week unit focused on plants and all the parents did such beautiful and thoughtful projects with the kids, I got teary reading about them in our collective notebook. 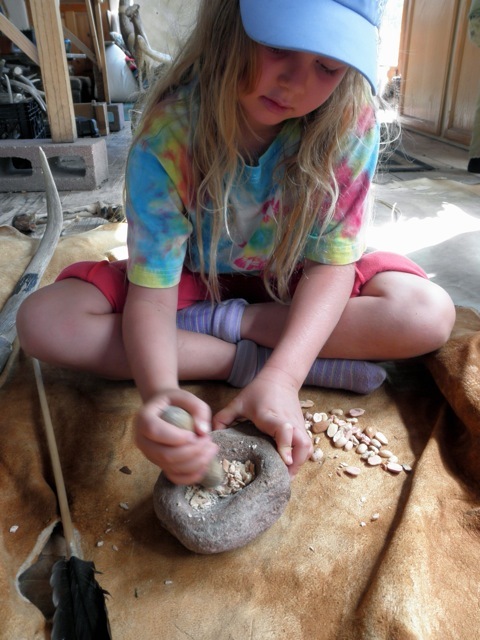 Now we’re studying Primitive Skills and Ancestral Ways. 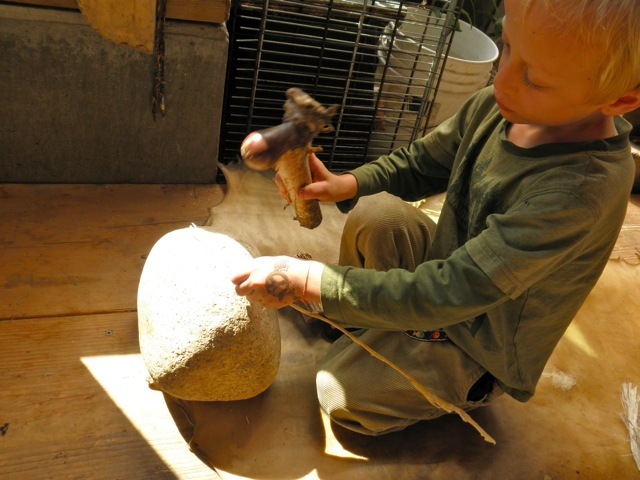 When I heard that one parent is going to construct a brush shelter with the kids, and another is teaching them to make fires primitively, my heart soared because this is Col’s exact fantasy. 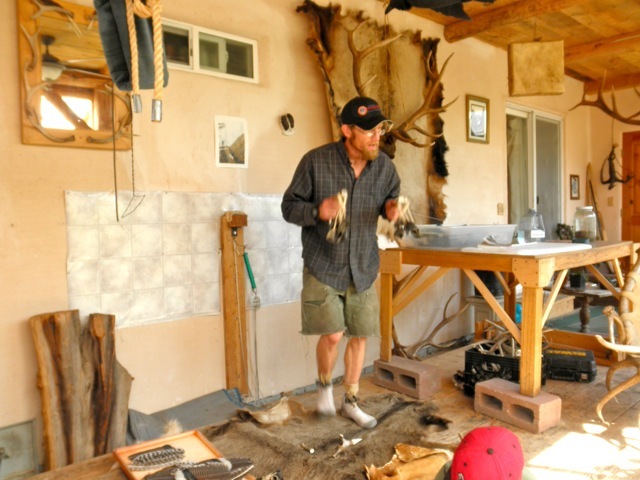 Dan got to be the Vanna White of primitive tools in his workshop of fascinating and unusual treasures. 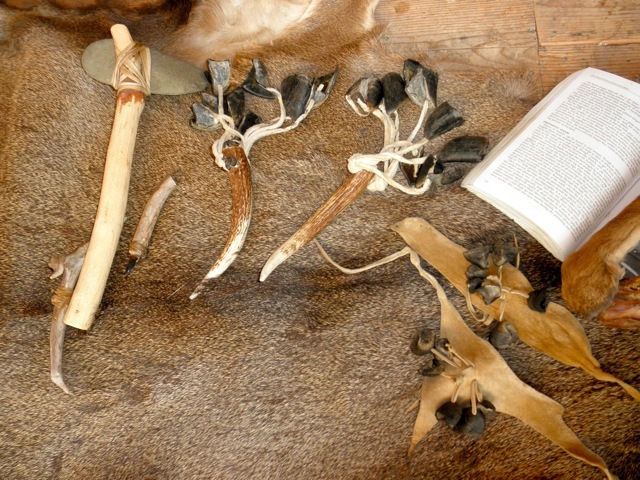 Here kids, would you like to pound deer sinew into fine threads that can be dipped in hide-glue and used to attach obsidian knife heads to antler handles? 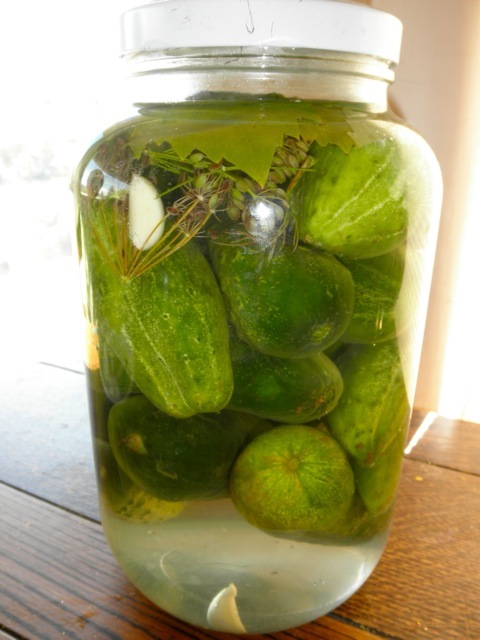 I finally got the lacto-fermented pickles down (recipe here). They are so crunchy and sour and delicious, when I eat them I feel like I should be sitting at the counter of a Brooklyn kosher deli with a guy named Moshe. (Or maybe that was the Brooklyn where my dad grew up in the 1940’s and 1950’s, I hear it’s different now). We pulled up some of the squash plants that were covered in powdery mildew, and it’s always amazing to me how little root can nourish so much plant. This zucchini root was about 6 inches, which is a good reminder that one foot of good soil is plenty deep. 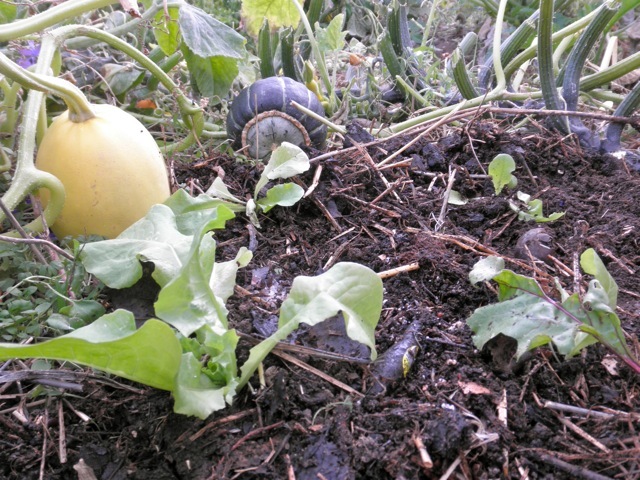 I sunk some lettuce seedlings in the spaces left behind by the squash we pulled. Soon the cold frame will go on that garden bed. Dan is working on tanning a hair-on deer hide, in the shed, at night, with the skunks. Yesterday a package came in the mail from Lacey, who was my partner for Mary’s amazing bioregional swap. Not only did we get elderberry syrup! gnome money! and herbal skin cream! but the kids got these beautiful hats. Lacey, color choice: perfect. 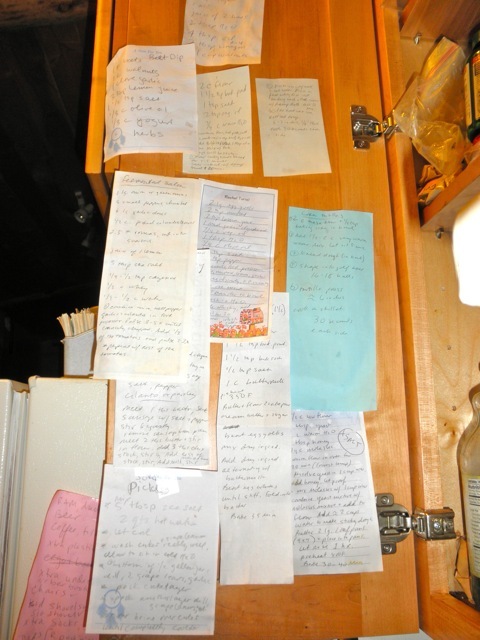 My current recipe collection, on the inside door of a kitchen cabinet, starting to get a bit chaotic. How do you organize your recipes? Seen on a bike ride, still laughing about it. Stinky? 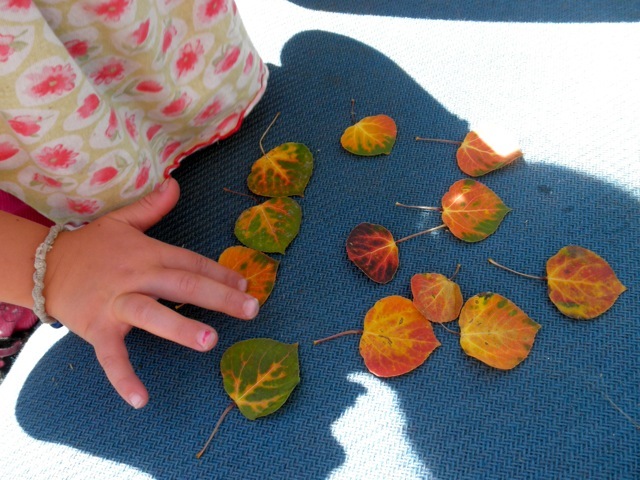 Aspen leaves from the high country. And really guys, it’s just frost, just the end of fresh produce from the garden and farmer’s market, just the end of bare arms until sunset. That’s all. Just like every other year; no biggie. If you need me I’ll be sitting vigil with the tomatoes, sipping the fermented ginger ale. ps: have you entered the fantastic giveaway yet? Um, sorry, you’re still cool. Waaaay cool. Laughed about Stinky. Love that story. And your love for the guy you married. Love the post and the pictures! 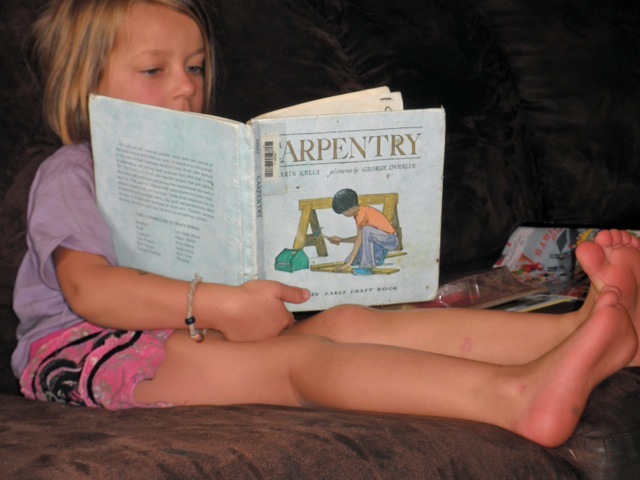 How do you have a homeschool session at the local public school? That sounds like my dream.. homeschool but still have a couple of days mingled with others kiddos. 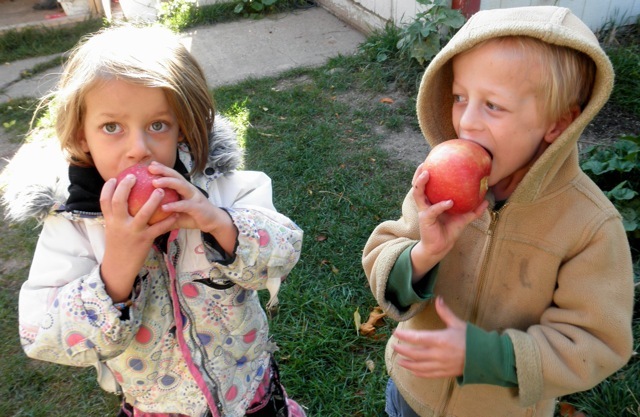 It’s a local program, this “shared schooling,” and probably could be imitated anywhere. I believe the public school gets $ from the homeschoolers and so is motivated to keep the program going, which has grown in students every year. It’s a really lucky situation: allows me to work, allows Col and I to have some space from each other, allows Col to feel like part of his neighborhood school where so many friends go, and it’s free! Yay!!! So glad the package arrived! We have been enjoying the lovely goodies as well, thank you so much. I promptly made coconut flour biscuits with the dried tomatoes and decided that grape jam could totally be slathered on them. Delicious! I’ve set the seeds aside until I can figure out the perfect spot for some Bee plants :) I cant wait to tell people, ‘Oh those? 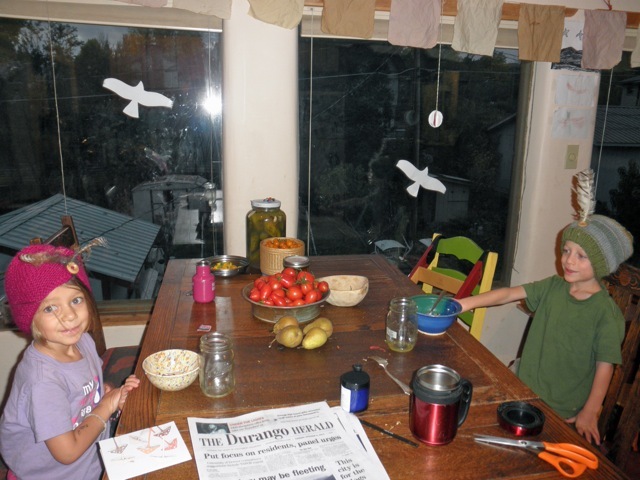 Yeah, those are from this really awesome family out in Colorado that sent me seeds they saved from their plants. And they’re really cool’. Also. 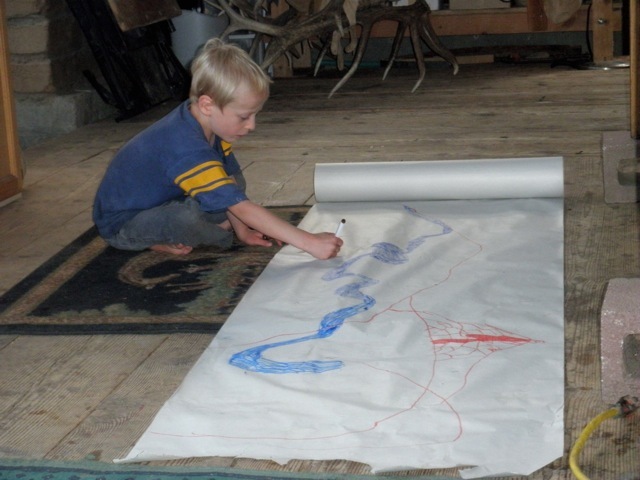 I want to come be a participant in your homeschool co-op. 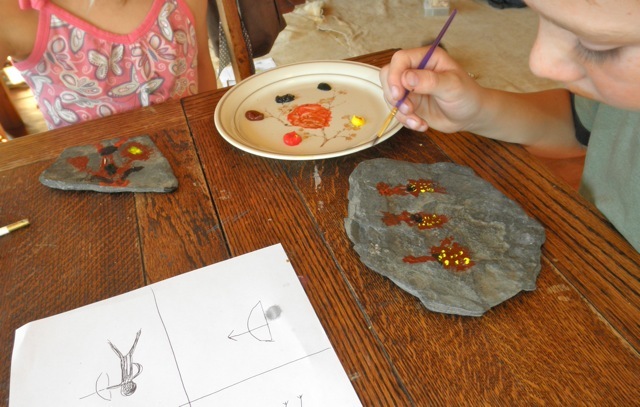 How fun to paint on rocks and make tools from elk horn! Your kids have it made. Thanks again for the homemade goodies! The way I remember it is that someone else was home. There was no cat door. You were in the kitchen letting her out while Dan was in his room letting her in. She was smarter than all of us put together. How else could one explain how she escaped from her cage and wandered innocently through a plane filled with passengers, without notice? I’ll never forget the look on her face when our eyes met and she was 7 seats up in the center aisle. I looked at the woman across the aisle from me and said, “that’s my cat”. Stinky will always be cool. hey hey! now i’m feeling guilty about dissing my garden! 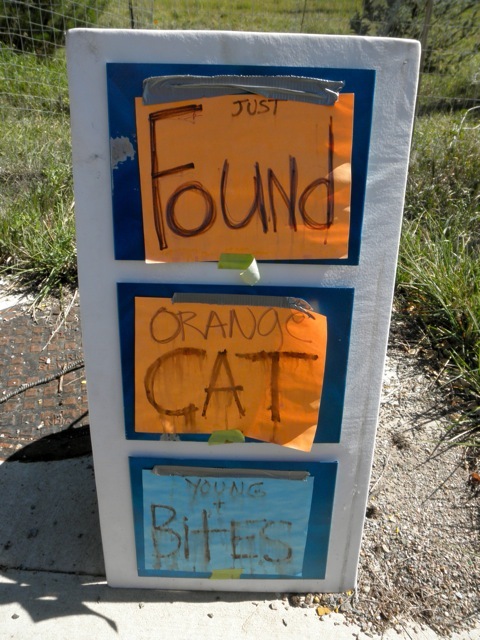 :) saw the cat sign, too. we thought it was ours that went missing a few months backs, but ours wasn’t so darn angry! 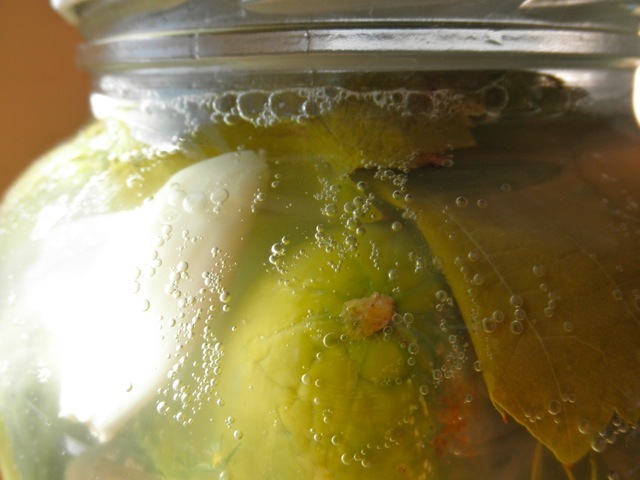 you’ve inspired me to post about how i deal with recipes…no rhyme or reason to it, but sort of fun…give me a few days! Amazing stuff! I love the school co-op! a) Wow, that’s still a lot of tomatoes (I just picked all of mine–green–in anticipation of frost tonight). b) Those pickles are beautiful! c) Love the cave-man homeschool. Oh Stinky…you are one funny kitty! really, i never saw you as a mom with kids at school. it just couldn’t last, you folks are so unschoolers. this is way more fun, yes? 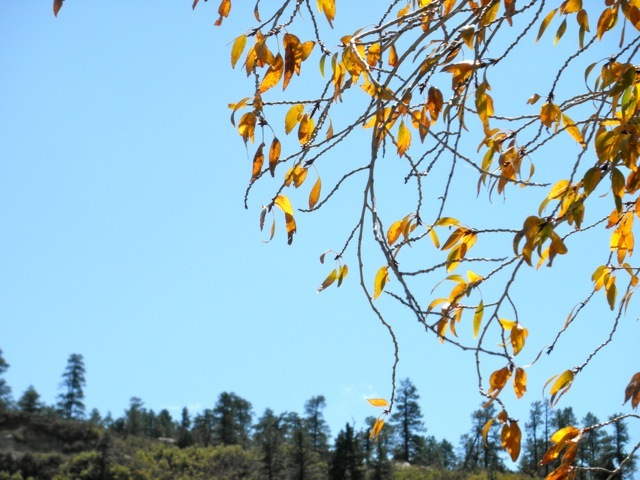 loved catching up, busy fall here too, though your kitchen witchery is forcing me to bow deeply to you. you are awesome with the lacto-everything! i wish i could take a class witchou. Recipes – I have a few small binders I keep them in. One strickly for canning recipes, the other for our favorites. I’ve actually punched holes in some of them, most are shoved in the front pocket. But, I know exactly where they are. And handwritten ones? I have a small notebook. Really, it’s much more organized that it sounds. Recipes – I have a few small binders I keep them in. One strictly for canning recipes, the other for our favorites. I’ve actually punched holes in some of them, most are shoved in the front pocket. But, I know exactly where they are. I made 2 gallons of ginger ale….. it rocks! Got a second batch ready to bottle this weekend. We put the last batch in a small soda keg, let it finish up in the laundry room and then put in the keg/beer fridge. I love watching the kids get soda out of the tap…. so cool!?! Have you visited nourished kitchen? We just signed up for a year of menus…. awesome stuff that is GAPS approved & GF and just good traditional food….. I get all swoony like I’m oogling over a new baby when I read the menu each week…. it’s ridiculous really. danna white is so awesome. quinn’s dad was attractive to me for some of the same reasons, though dan seems to lack in the areas that made me decide to leave him. but yeah, quinn’s having a good time with his bow and arrows with obsidian heads attached with sinew and, in his case, i think not hide glue but pitch. and speaking of deer… was it a town deer? hahhahaha organized recipes. yeah right. I made some ginger ale and bottled it. It is still very good – slightly alcoholic (1-2%?) – bubbly and not vineger. Mixed with vodka and fresh lime juice and a lovely Moscow Mule is in my hand!! And you keep the ginger ale out of the fridge? Maybe the alcohol is just a byproduct of the yeast eating the sugar? Did you buy yeast or harness the wild ones? Hey, how did my cat get to Durango? Is yours the stinky one or the one that bites? I’m undoubtedly enjoyin your blog and look forward to new posts.